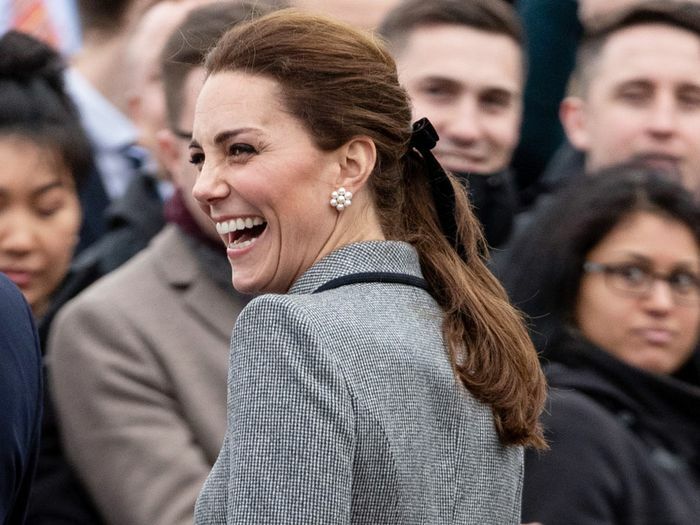 Kate Middleton is no stranger to triple-digit-price designer pieces, from Jenny Packham dresses to Alexander McQueen coats, so when she steps out in an ultra-affordable item, you can bet we take notice. Attending an event in Leicester this week, the Duchess of Cambridge wore a J.Crew Velvet Hair Tie ($23) that we want ASAP. A cute hair bow is the easiest outfit add-on that still packs a punch, and now that it's royalty-approved, it's pretty much a no-brainer. Of course, we love the rest of her outfit as well. She wore a coatdress with tights and Tod's heels, along with the Aspinal of London Midi Mayfair Bag ($725). You might remember that she and sister Pippa both wore the bag brand back in September, causing a shopping frenzy for the sleek British bags. The brand's top-handle silhouette is ideal for Middleton, who hasn't worn a shoulder bag (among other trends) since becoming a royal. Scroll down to see and shop Kate Middleton's new outfit.